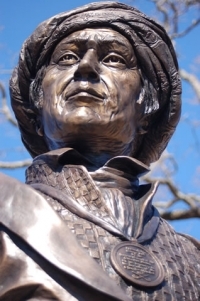 To communicate our pride in our alma mater and our support of quality education, the Sequoia High School Alumni Association is erecting a bronze statue of the great Cherokee scholar, Sequoyah, which will sit on a pedestal. The statue will be in a prominent interior location of the school that will lend dignity to its presence. Creator of the Cherokee writing system known as syllabary, Sequoyah reflects the great history of Sequoia High School, capturing the importance of education and global understanding. He is the perfect symbol of this institution, “Sequoia” being the Latin form of Sequoyah. Sequoia High has been the great education center of Rewood City for 120 years. This statue will help future students to learn that the man after whom the trees and the school were named was an educator.